Finding intelligent life on earth should be our primary concern. Irreducible complexity? No problem for the scientific priesthood. To this priesthood, the existence of water automatically equals the possible existence of life. I'm convinced that they pump this crap out to gauge public credulity and depressingly, it seems that said public are pretty much 100% duped. "I had a Rover once. Kept failing its MoT, I wouldn't want to rely upon one of those. Seriously Gillian, I do think you've been watching too many sci-fi films. Just keeping the Space Station serviced and provisioned is a challenging enough task and it's only a couple of hundred miles from where I'm sitting. If this habitat and these supplies are delivered more than about a mile from where you land, that's your party over. It took the rover that's already there weeks to cover less distance than that. Go and work in Antarctica for a couple of seasons if you have a thirst for adventure and see whether you still feel the same about going to Mars." "actually i'm very behind on my sci-fi films! Need ot watch them all asap. Antarctica is indeed part of the training yeah. Also they can and will land things on Mars with better accuracy than you are imagining so that's not a problem. (And a mile is a short distance which wouldn't cause a problem)"
The scientists behind NASA's Mars exploration mission are "completely confused" by the sudden appearance of a mysterious rock on the surface of the Red Planet. During a briefing at the Jet Propulsion Laboratory (JPL) in California last week, Mars Exploration rover lead scientist Steve Squyres said the rock recently appeared, apparently out of nowhere, near the Opportunity rover. "It's white around the outside, in the middle there's kind of a low spot that's dark red. 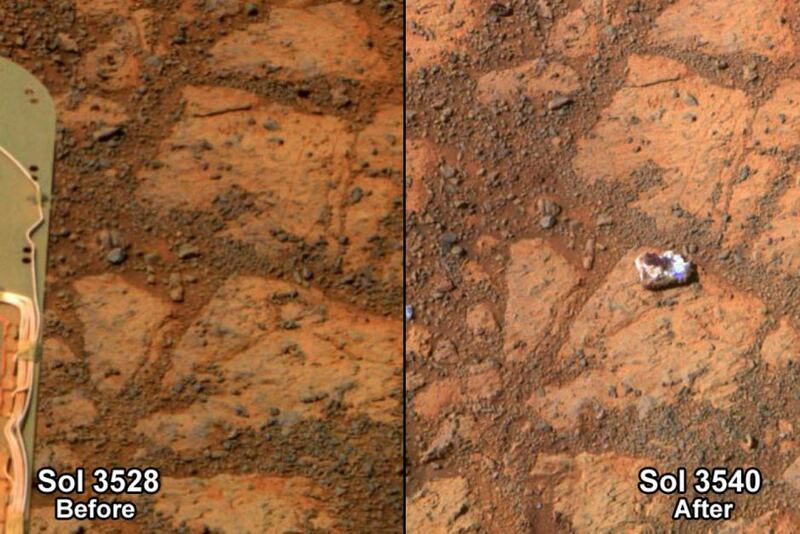 It looks like a jelly doughnut," Squyres said of the rock photographed in a location where nothing had been 12 Martian days earlier. I wonder who dropped the jelly doughnut on the Mars set? 12 Martian days ? I knew that Tim Horton's franchise doughnut shops are expanding rapidly but when did their first Martian franchise open? It's too damn funny. You just can't make this stuff up. Maybe on Mars days are 9 hours long and their weeks lass 11 days. The shops would be open 9/11 instead of 24/7 like here in Canada, home of the CSA. A huge source of Canadian pride stems from "we" having developed the robotic arm used on the space station. It's known in these parts as the "Canadarm or CanadArm". Canadian media is hyping the returning Space Shuttle ASStroNOT captain, Hadfield ad nauseum as a national hero. He's written a book, and touring to promote, sang the national anthem at a Toronto hockey game, etc. Makes me want to puke to think how many hundreds, and thousands, of millions of dollars have been stolen from the population in the name of this grand larcenous hoax of a psy-op! Interesting...there appear to be numerous versions on the internet of this supposed 'before and after' shot. Note references again to this purported energy beam spectral analyser, that remotely zaps then identifies the chemical composition. This tricorder donut tester sounds like a proper depth-of-doubt challenge, to me. A gauntlet, cast down at the foot of >your< screen, dear earthling consumer. NASA: "...Pinnacle Island may have been flipped upside-down when a wheel dislodged it, providing an unusual circumstance for examining the underside of a Martian rock." What good is a robot arm that can't flip a rock over? Yet another publicity stunt from our illustrious “baffled scientists” (BS) keeping the hoax alive for the legions of saps who swallow this crap without question. 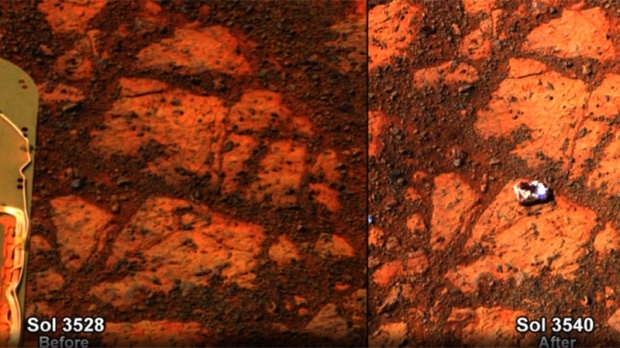 Have NASA given any supposed explanation as to the curious differences (semi-similarities) between the shapes on the rock floor? I'm expecting the usual suspects to be trotted out: perspective variation, slant distortion, composite mosaic artefact. Is this perhaps (in decending order of probability) down to: double-disinfo faux 'realism'; shoddy pixel-fiction; or...whistle-blowing, even? Perhaps I am an ignoramus in matters of geology and lack imagination, but isn´t that exactly what rocky/gravelly ground looks like when eroded by rain? Flabbergasted wrote: Perhaps I am an ignoramus in matters of geology and lack imagination, but isn´t that exactly what rocky/gravelly ground looks like when eroded by rain? Which is exactly why it is so obvious the images were taken on earth - to the extent they weren't created wholesale on a computer. So that means the photo was colorized but if it was colorized why did they leave the rock white in the colorized version? What is it about this image that indicates erosion by rain? The finer sand has been "washed into" the spaces between the larger rocks. It looks compacted, not loose. The loose gravel on top of it reflects the topology of the rocks as if deposited by retreating water. I wouldn´t say this "indicates" rain, but it is a perfect resemblance to a weather-beaten driveway. I can´t say whether an environment with very rarefied atmosphere (thus, practically devoid of humidity) would produce the same result. @1:58 "... we've looked at it with a microscope ..."
Really? You looked at it with the microscope? Which, like any microscope is used for close-up viewing? So you moved the rover over to it and whipped out the microscope then? But, I was under the impression that the rover hasn't moved since this rock photo was taken. Or, for that matter, why don't you just rotate the rover's camera around in a big 360 and see if there is a new impact crater nearby as you suggest for an alternate explanation for the appearance of the mystery rock? lux wrote: @1:58 "... we've looked at it with a microscope ..."
@2.22 "...as I said, Mars keeps throwing stuff at us..."
So do we, NASA, so do we !